Pretend you are a kid on Christmas. All you can think about is getting that toy you have been begging for since the beginning of the year. Imagine your parents saying you would be getting that toy, only to walk down to the tree morning of, and realize the toy isn’t there. National Signing Day is considered by many to be just like Christmas. You picture landing every kid your school has extended an offer to, especially because those kids are adamant about attending your favorite school. Today, Oregon received the news that long-time verbal commit PJ Locke had switched his intention to the University of Texas. 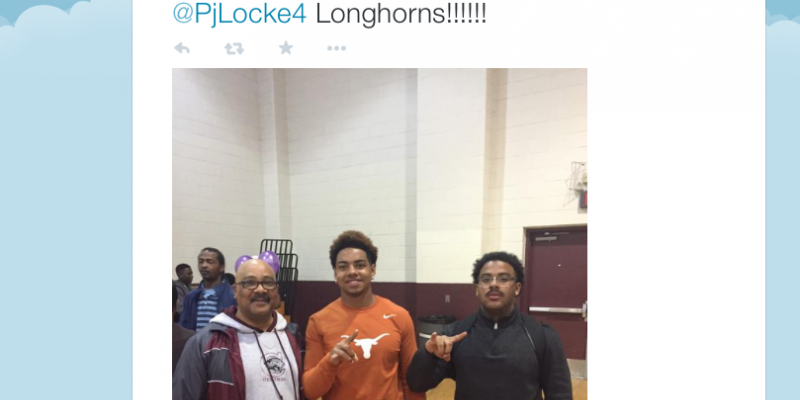 Locke signed with the Longhorns today. National Signing Day can be good, but it can also be very bad. Locke, for example, is a guy that has been very adamant about his intention of signing with Oregon. You can never trust a verbal commit, however, as Locke’s ultimate dream school came knocking on Sunday with an offer that seemed to complicate things. Being from Texas, it was thought that if Locke had received an offer from the Longhorns, he would take it. That offer came in Sunday, Locke posted on Twitter Monday that he was still committed to Oregon, and then signed with Texas today. The moral of the story is simple — you win some, you lose some. The best way to counteract bad things happening on Signing Day is by working hard to create a recruiting class filled with depth at every position. While losing Locke is big, Oregon still has a strong list of recruits, and who knows, maybe the Ducks can steal one from another school. We’ll just have to wait and see. Stay tuned to FishDuck.com for all National Signing Day news.